Not only have Ben and Fatty won back to back National Cocker Championships, they have been to the final on four consequetive occasions. Ben Randall first partnered with Kronch three years ago and quickly understood the time and consideration that goes into making a food fit for working dogs not only helping them become top of the league but helping many other dogs throughout the world compete, work and run at any level. Its all about conversion to energy. After lengthy discussions with Graham Tweed of Kronch they jointly set upon a project to design a food aimed and focusing on working dogs and after two years came the launch of Champions Choice. Produced in Denmark from the highest quality ingredients at Kronch’s own closed facility from fresh Salmon delivered daily to the plant. The food is now tested, approved and available to you from the Kronch website or from selected stockists and of course Ben Randall himself. INGREDIENTS Fish (16% fresh salmon, fish meal), rice, maize, barley, lard (food grade), blood meal, brewer’s yeast, sugar, lecithin, garlic, vitamins and minerals. Champions Choice contains 22% protein and 14% fat and comes in 15kg sacks. 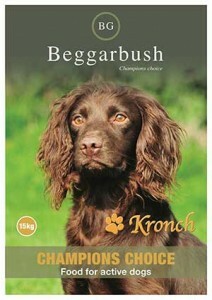 You can purchase this feed now via the Kronch website – Home of the working dog!